Live and Silent auctions have become common place at many fundraising events. Some organizations even host very successful stand-alone auction fundraisers. Just because the idea of an auction has become common place does not mean that your auction needs to be the same old thing. In order to keep donors engaged and excited, there are strategies that can be put into place for the event. Try putting a cap on the number of items offered in your auction. Nothing saps a donors energy and excitement about the event more quickly than an endless menu of auction items. Ideally, one item should be offered for every four guests in attendance. Another way to avoid losing the donor is by moving the auction up the agenda. Many organizations hold the auction hoping it will be the exciting finally of their event. Unfortunately, by the time the auction comes around, donors are tired and some may have even left for the evening. Begin the auction during dinner to hold the donors attention. A great strategy to encourage donors to open their wallets is to introduce a client testimony just before the auction. Try putting together a simple video testimonial that tells the problem, but showcases the results. This will remind donors why they are there and where their money is going. The emcee can even refer back to this testimony throughout the auction to keep that organizations mission at the forefront of donor’s minds. A professional auctioneer can take your auction event to another level. Investing in a pro will bring a harvest of benefits for the organization. A professional auctioneer can keep donors engaged and keep the excitement going throughout the duration of the auction. The investment is worth it. Adding a theme to your auction event can help to keep donor interest. With proper promotion, donors will be excited to see the new theme year after year. If you are holding the event at the same venue each year, a new theme will help you come up with a new room set up each year, keeping the room interesting and keeping donors engaged and aware. 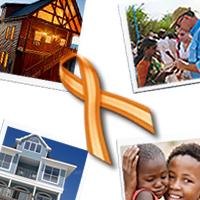 Another great way to boost auction revenue is with Geronimo’s Vacation Rentals for Charity. Geronimo makes it simple to offer great vacation locations to your auction item menu. Geronimo’s plan even offers a website OneSpareWeek.com where you can advertise the vacation auctions prior to your event. Rather than using a board member’s vacation home at the same location year after year as an auction item, Geronimo offers vacation homes from around the world, spicing up the auction and adding new energy to the old event. For more on featuring vacations at your next fundraiser please read A Unique Fundraiser and New Auction Tools. Investing in your auction event is always a good idea and will pay off in increased revenue. Keep it interesting and keep donors engaged. Success will follow.